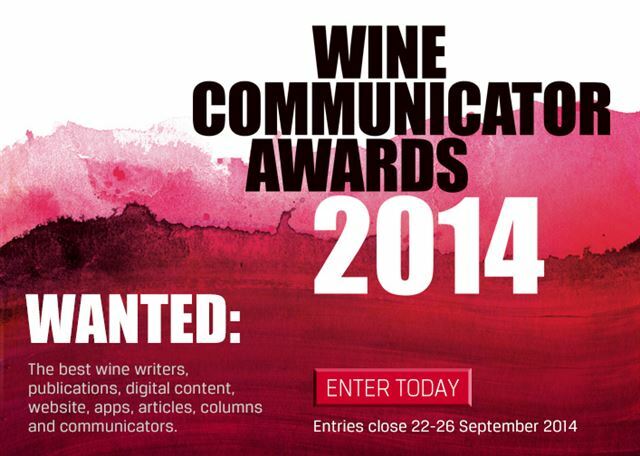 Entries for the Wine Communicator Awards 2014 open today (July 2), and Wine Communicators of Australia invites the Australian wine industry’s most talented writers, designers, publishers and communicators to nominate. 2014 sees the addition of a new Award for ‘Best Wine Book’, and organisers Wine Communicators of Australia (WCA) also welcomes several new Award sponsors. The Awards include WCA’s established Wine Communicator of the Year and Best Digital Wine Communicator, as well as the New Wine Writer of the Year, which is run in partnership with Gourmet Traveller WINE Magazine. WCA Chairman Angie Bradbury said these Awards acknowledge the industry’s best communicators as well as the most innovative, creative, courageous and inspiring people who record their words -through print, radio or video. “It’s fantastic to see the winners from last year’s awards – Jane Thomson, Andrea Frost, Tyson Stelzer, Campbell Mattinson, McWilliam’s Wines and Greg Plowes – who all continue to build their careers and leverage their achievements in the awards – we’re extremely proud to support them in their efforts and excited to build on last year’s successes,” Ms Bradbury said. Last year’s Digital Communicator of the Year and founder of The Fabulous Ladies Wine Society, Jane Thomson, also encouraged fellow industry communicators to get involved. “The WCA Awards have had an enormous positive impact on my business and my personal profile in the wine industry. Winning this award has led to some incredible opportunities and privileges that I could never have anticipated. All I can say is, if you’re thinking about entering the awards do it,” Ms Thomson said. The judging panel for the awards consists of a mix of industry professionals, including WCA national board members, current Digital Communicator of the Year Jane Thomson, Wine Communicator of the Year Andrea Frost, Legend of the Vine David Lowe, VinTank’s Paul Mabray and Anne Duncan, from the Australian Grape and Wine Authority. The Gourmet Traveller WINE/WCA New Wine Writer Award will be judged by editor Judy Sarris, contributing editor Huon Hooke, and WCA Chair Angie Bradbury. Entry to Awards is now open for all wine professionals in Australia. To enter or to learn more about each award, eligibility and judging criteria go to: https://winecommunicators.com.au/awards/. You can also follow Award updates via WCA’s Twitter tag: @WineComAust and #WCAwards.